There’s a partner (Sergey) at a company based in LA, with a growth perspective as big as a mountain but still working on one floor in an open office environment. They Just have been bought by a very big player in their market and the sky is the limit now. Truth is that they don’t want to make budget moves now that get withdrawn later. They want to make choices but they want to secure their investments in their company and in their work environment. Maybe they will move, maybe they will grow on the same location, it all depends. They want to look good as a company but also need their privacy and the protection of their work and equipment. They’ve just been working over night and are going out for lunch now. They’ve left their computer open, closed their Beeboxes and walked out of the door, laughing and screaming over their latest victory. Sergey checks his app. Yes, his Beebox is locked and his computer is rendering. He is hungry. They are having fun! In this scenario, Sergey needs two things: to know that his work is save and, on an immediate level, food. His Beebox fulfills one of these needs, the rest he can fill in however he likes with an ease of mind. 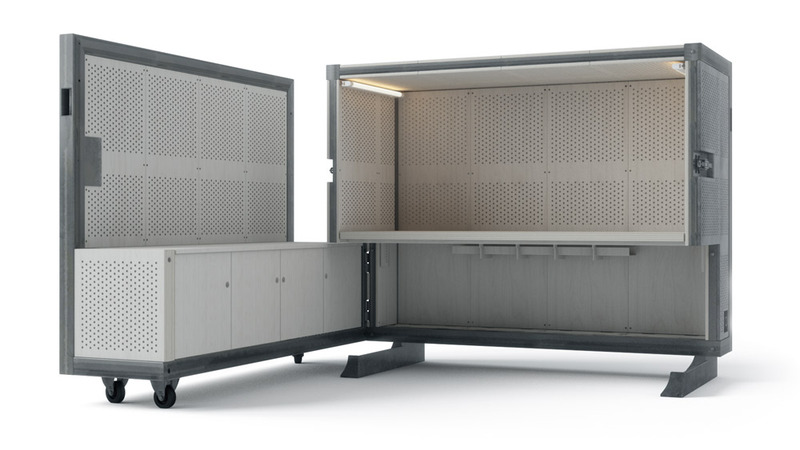 We designed the Beebox Mobile Office for Growth, privacy, mobility, safety, change, plug and play, all in one, space saving, personalisation of the workspace, comfort and beauty. Beebox Mobile Office is Dutch Design from Amsterdam and also made in the Netherlands. Beebox Mobile Office has been designed by Bart de Groot and Christoph Veen.